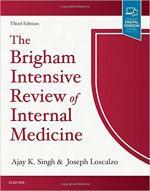 Now in its third edition, the textbook, The Brigham Intensive Review of Internal Medicine, is a comprehensive study guide for the American Board of Internal Medicine certification or maintenance of certification examination as well as for general practice review by physicians and residents. This authoritative, thorough resource provides in-depth coverage on all specialties of internal medicine, as well as palliative care, occupational medicine, psychiatry, and geriatric medicine. Editors Ajay K. Singh and Joseph Loscalzo recruited leading authorities from Harvard as well as former chief residents at Brigham and Women's Hospital to contribute to this book. Featuring over 600 board review questions with numerous tables and figures, chapters offer detailed discussions emphasizing essential learning points. Over 100 chapters are organized into 10 broad sections, with one additional section dedicated to board simulation. As the required content for the American Board of Internal Medicine continues to evolve, studying can prove challenging. The Brigham Intensive Review of Internal Medicine is the ideal study guide for anyone preparing for certification or recertification. Recent attendees have found this course to be an indispensable review for their ABIM Board Examination preparation. This CME program is one of the most comprehensive reviews of internal medicine offered by the clinical faculty of Harvard Medical School. This program has sold out in past years, and is among the highest-rated Harvard Medical School CME courses. To ensure a place in the 2019 program, early registration is strongly advised. Year after year, attendees report that this course is “game changing”—invaluable to their clinical practice and exam preparation efforts. Click here to find out how.